Contains ingredients which help clear acne, seborrhea, skin bumps and helps remove bacteria. Leaves a clean fresh feeling. Provides a Mask worn at night and day to condition the skin and reduce acne, or bumps. The Mask is light and can be worn under makeup or sunscreen. There is NO OTHER 2 sided soap combination available to provide these results. 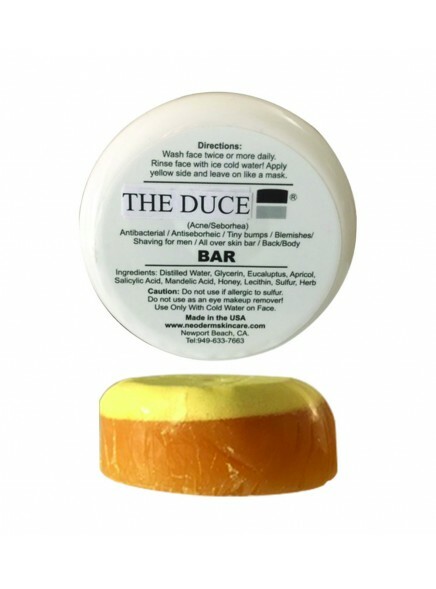 Always follow directions included with this unique soap bar product. Wash the face 2 times and lather using both sides of soap! Rinse off The Duce Bar using a Washcloth Saturated with cold water (washcloth that has NO Downy or Bounce or any fabric softeners).Squeezing the washcloth and wiping The Duce Lather soap bar off the face. Rinse the Face 27-30 times with the very cold water with the washcloth. THEN APPLY WITH THE FROZEN DIXIE CUP AND ROLL OVER WET FACE A FEW TIMES. Use bottled water and fill 3-4 DIXIE CUPS AND FREEZE.